- the pitch (how many half-tones the reverb is pitched to). Ranges from -12 half-tones for a very darkish sound to +12 (traditional shimmer). At 0, there os no pitch, resulting in a “simple” yet very wide and beautiful-sounding reverb. - add to this modulation (mod rate –speed- and mod depth). It’s mostly heard on the reverb tails. The color (bright or dark) can also be chosen. I prefer the bright flavour, especially for such an effect. The controls are very well explained when you hover over it with your mouse.Although complex, its use is very intuitive and the factory preset is a very good start (I almost never change it btw). So first, we already have a great reverb, excelling for everything ambient. I could play with it for hours, each note resounds and you’d let it take you away. Beside a great effect, it’s also a very good composition tool to leave the beaten paths. And when you push the feedback setting… This is when the shimmer shows its real color! The notes are pitched one octave higher, resulting in a sound close to synth pads. In the samples that I’ve included, I’ve strummed a very compressed electric guitar. Then, I put it through the shimmer while taking the dry sound away: here’s how to imitate a synth using a guitar! Its possibilities are very numerous. You can manage the shimmer’s stereo width (small, average or large) or keep it mono. The result is very different from one setting to another. A shimmer set large with a small diffusion gives the impression that each note rockets in, blossoms at the octave. Listen to the included "blossoming shimmer" sound sample. This impression is reinforced by the small stereo setting. Keeping in that direction, playing short notes with no feedback, you’ll get a slapback-type reverb. A shimmer to be tamed ! Inversely, the larger the stereo and the more it sounds like waves, the ocean… beware not to get drowned, though ^^! Listen to the "extreme shimmer" sample, where the dry progressively vanishes as the waves of a shimmering ocean progress… Or the "Shimmer la mer" sample, where I imitate the sound of a wave crashing on rocks. With this plugin, soundscaping is now within reach! Finally, when you change the size parameters in realtime, you can imitate a rocket taking off… The "crazy shimmer" sample renders just this. Beware your ears and definitely DO use compressors, or the sound can literally skyrocket!!! Four pitch types can be chosen from : normal, dual, reverse and dual reverse. You’ll need to experiment, but beware though as the shimmer can be very invasive. In my samples, I put a compressor beforehand (to straighten the source as much as possible) and another after it so as to limit the volume variations. Playing has to be as delicate as possible, with very little notes (with a guitar at least). The shimmer doesn’t react very well to an overdriven guitar, perhaps because a distortion and reverb sound too close to each other. 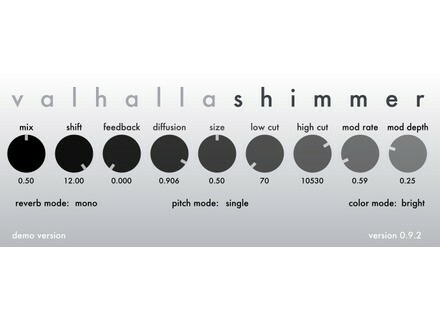 Valhalla makes very good plugins, this shimmer is excellent and includes a very high number of features that make it the number 1 in its category, according to me. It can be used “as is” very easily, but those who want to tweak its various functionalities will find ground for exploring and experimenting!